When considering who you might share a mortgage and house with to get on the property ladder, it is reasonable to consider members of your own family early on in the process. Should Ed Miliband get the keys of 10 Downing Street in the 2015 election, he won't be sharing with his brother David...but there is the small matter of David's defeat in the Labour leadership contest which has certainly altered circumstances! Hopefully for most, family members are a good prospect to consider sharing a house with - you know them and their habits well and will have had the chance to gauge whether you like them over a long period. You can still best protect your own and their individual interests against unforeseen events by drawing up a binding legal agreement before you start your share. Sharing with family? Get Shared Ownership Protection , the legally binding agreement which protects the individual interests of all house sharers. For more information, call 0207 112 5388. Share with a family member? Families are famous for rowing, aren't they? It is true that words uncounted have described family arguments but on the other side is the number of proverbs such as 'blood is thicker than water', which attest to the strength and families, particularly in challenging adversity. Ed and David Miliband certainly reached a point in their professional lives when they were in clear adversity. Shortly after David's defeat he even left UK politics and took a job in the US. There's no indication, however, of great personal animosity between them and it would be a brave person who'd bet against David coming around to tea at No 10 should Ed take up residence there! Families often have large numbers of things in common. A sporting family will share a love of sport, families often stick to one football team and family members are known for borrowing each other's clothes, hopefully after asking! There are factors such as common religions to consider as well which can provide strong ties and mutual understanding. What if we fall out despite the best intentions? There are truly no guarantees in life but in sharing, the preparation and planning that you do beforehand are key. With family members, you won't have to worry so much about things you don't know about a sharer. You still, however, must think about many possible outcomes and what your strategies will be in these situations. Family members might initially be reluctant to plan for challenging outcomes - they might well assume that 'everything will work out all right' - but life often throws up situations where someone might want to leave an arrangement or friends and family fall out. We advise that you give yourself the best chance if you think through scenarios and draw up a legally binding agreement before you start sharing to protect everyone involved. What would be in this legally abiding agreement? In any share, particularly when contributions are unequal , everyone should feel secure that their exact financial stake in the arrangement calculable at any point. If you suddenly need to leave a house share, you will want to know then what your stake is worth.This financial measurement is the central part of the legally binding agreement and is called a declaration of trust. You may also want to draw up some house rules for example in relation to whether visitors can stay over, whether sharers can have pets or whether anyone can smoke in the house. This part of the agreement we call the cohabitation agreement. Any legally-binding agreement you draw up will, of course, have to reflect the individual, bespoke needs of your particular arrangement. 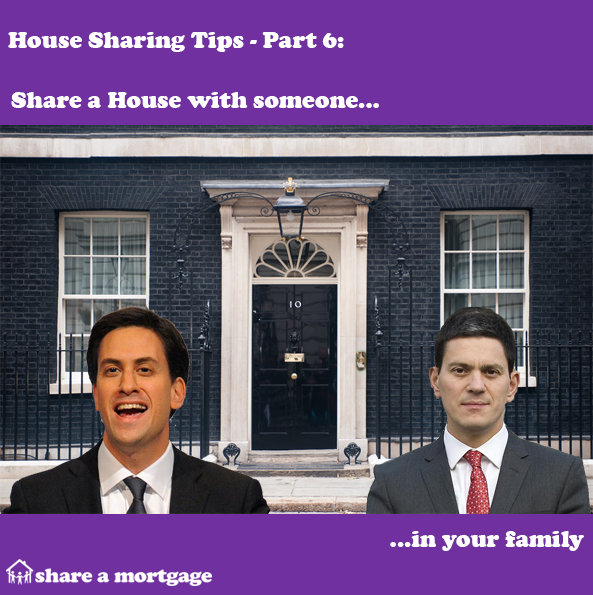 Share a Mortgage's Shared Ownership Protection is the bespoke legally binding sharing agreement, centring on a declaration of trust and an optional cohabitation agreement, which protects the individual rights of all sharers in a house share.